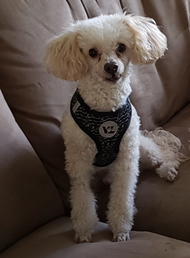 About Wade ADOPTION PENDING: Little male cream colored poodle with apricot highlights. Making Friends with Wade: Wade is very sweet. He does bark while on a walk and he is the first to bark when he hears a noise. He definitely needs a fenced in yard to play in and if he is being walked needs someone with experience to correct his barking.